DID Delegate Peace Come Out for the Mandatory Individual Mandate? Sure Seems That Way… | Virginia Right! Posted on April 3, 2018. “The Trump administration has shown a real willingness to work with us and allow us to come up with our own solutions. This could turn into a movement for states,” says Utah state Rep. Robert Spendlove, who sponsored a Medicaid expansion bill. Like Utah, Virginia’s GOP-controlled Legislature had stalled the governor’s hopes of expanding Medicaid for years. But with the option to add more conservative elements, Republicans are now actively supporting it. As for our delegate, here we have perhaps heading toward the heart of the matter: The old Bushian slogan: Compassionate Conservatism. Can’t make this stuff up! We know what Compassionate Conservatism got us – endless wars, Medicare part D, too much loss of liberty, globalism, condescending speeches…. I gave up on President Bush when I discovered Ronulus Magnus II (Ron Paul) and kept my speech fast (except for Obama’s first inaugural and the bin Laden capture) pretty much up through the Obama years! Our present Chief Executive gives great speeches! Although Republicans have been a roadblock to the ACA, Virginia’s Peace notes that the idea that everyone should have some form of health coverage was actually a conservative idea decades ago. So Delegate Peace FAVORS the individual mandate? Please say this was another late night interview and you were tired. Please? I doubt it. Maybe we need a Dave Brat in the 97th for 2019. ← Go To THIS FB Page and Answer Del. 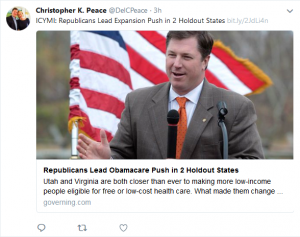 Peace’s Comment on Medicaid Expansion! Virginia has lost over $10 BILLION by Republicans being stupid and not expanding Medicaid, Sanford. Our money went to better managed states. They enjoyed spending our $10,000,000,000. I, and the vast majority in the 97th overwhelmingly support Peace with Medicaid expansion. Dave Brat has been a flop. I cannot at this point see any avenue to Brat being re-elected. Middle Resolution board members Phil Rapp and Nancy Smith ran Dave Brat’s campaign volunteers off last election cycle and Dave just might be available to move to Hanover or New Kent when he loses his congressional seat in November. Be careful what you wish for Sandy Sanders: a Brat run for Peace’s office in 2019. Nancy Smith would repeat her 2016 actions and charge Brat $65,000 for the R-Votes data the Hanover Brat Pac volunteers collected for him for free in 2014. LOOK UP BRAT”S FEC report on OPEN SECRETS. Are the readers of Virginia Right catching on to the Whirlpool washing machine scam of Middle Resolution Pac’s R-Votes program yet? MR Pac recruits innocent volunteers to work for their candidates knocking doors and phone banking and then SELL that very data back to the Candidates paid for by the unsuspecting campaign donors. MR Pac is the Evil Arm of the Republican Party of Virginia.